In two previous postings I shared the results and lessons learned from my first vegetable garden in 2011 (Ideas Seeded from My First Vegetable Garden) and the creation of a new edible garden in early 2012 (Applying Learnings to a New Vegetable Garden). The second posting concluded with a few observations related to the importance of good soil, the benefits of planting in squares, the use of kitchen scraps for compost, and the need to regularly maintain the garden. With summer coming to a close on September 21, I want to provide an update on the new garden. 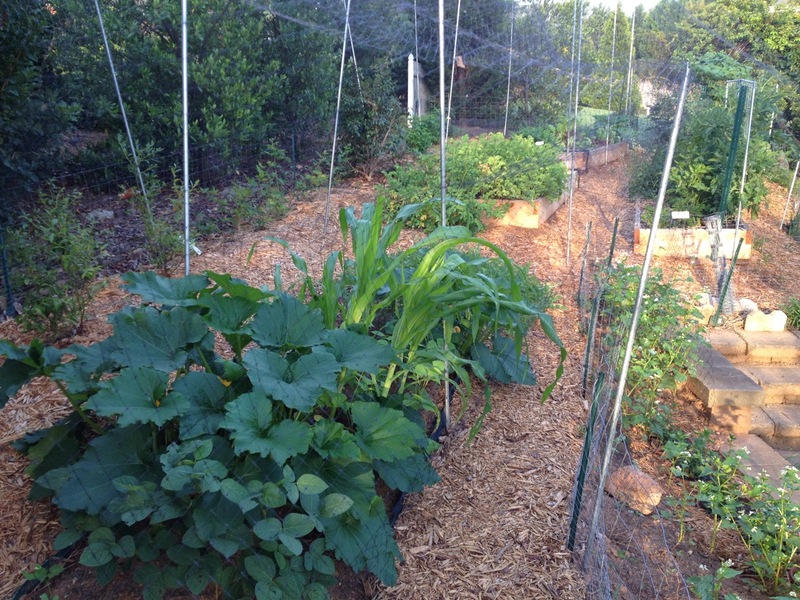 The plantings in the new garden and the results of the harvest through mid-September. New observations and lessons learned from the garden. This year has been an excellent learning year, and these new observations will be helpful in improving the garden going forward. The new edible garden includes four raised beds totaling 140 square feet, a slightly mounded bed (to eventually be used for perennials), a long row of berry plants along the back fence (blueberry, blackberry, and raspberry), and a potted herb garden. The garden also includes a double barrel composter, two rain barrels, rabbit fencing, and bird netting.